The difficulty for groundhoppers visiting tournaments such as the African Cup of Nations is that we cannot always stay for the full tournament. The Cup takes three weeks, but has only four venues, so all can be visited, and all the teams concerned can be seen by taking a trip in the first week. So by the time the knock-out matches start, I am limited to seeing them on the TV. 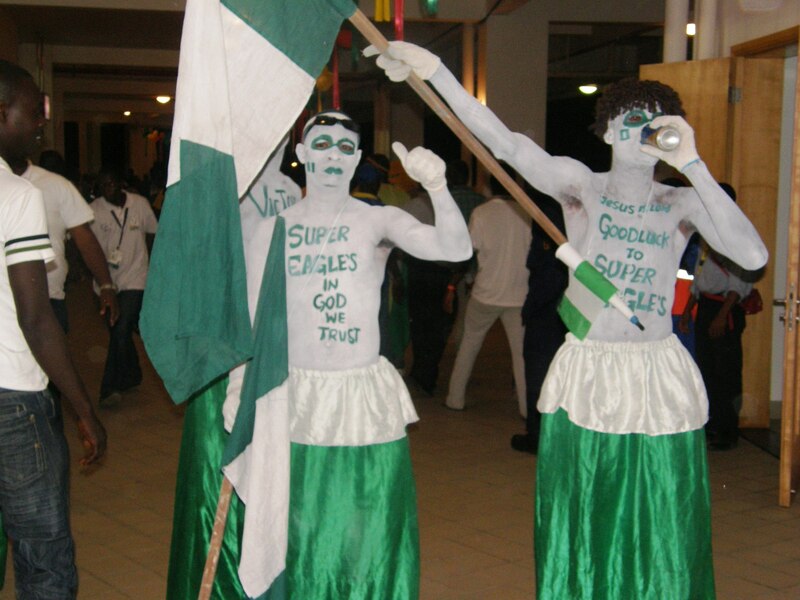 Having seen all the teams, I did have the measure of the quarter-finals; Ghana beat Nigeria with goals from Michael Essien and Junior Agogo  Yakubu had put the Nigerians ahead, while Guinea, still without the suspended Pascal Feindounou were never a match for Ivory Coast  Guinea collapsed in the second half and went down 5-0. Another super-strike by Manchester United bound Manuchno was not enough to stop Egypt progressing 2-1, and Cameroon got the better of Tunisia in a lengthy tie, finishing 3-2 aet. Over the course of the week, we travelled around the country by a variety of transport methods. The inter-city coach is the easiest, with a fixed timetable (which is not always adhered to), and fixed prices, and a degree of comfort. The tro-tro, mini-buses than can seat 22 people lose any degree of comfort, and work on a fill up and go basis. This can mean an indefinite period waiting before the transport leaves. The prices are fixed, and by paying for two seats in order to give oneself more space, means paying more than the bus fare. The longest overland step of our journey, from Kumasi to Tamale was done on an overnight tro-tro taking 8 hours. The five members of our party took 11 seats between, firstly for comfort, and then to get the bus on the road. We left soon after midnight, but one could imagine waiting until daylight before the bus filled up. Air travel also has its problems  we had tried to book our one internal flight by internet from the UK, and had apparently made a reservation  but not paid. Payment had to be in cash, and had to be done locally. Fortunately we sorted this the day before travelling, when we found our reservations were not on their list (but there were still enough spaces for us), and that the flight was to depart four hours earlier than the schedule quoted on the internet! For us, local transport within towns was by taxi, which were the same as most taxis, slightly decrepit vehicles being driven at too fast a speed. Most would give a sensible local rate quickly with negotiation. One of two tried their luck to up the rates for white men, but would then give up when challenged. Basically, you can travel anywhere in the capital for not more than £2, while half that will do in the other cities. At the end of my trip, our taxi was travelling too fast down a dual carriageway when another pulled out in front of it. Fortunately, the speeds were not so great that the lack of seat belts came into play, and only the taxis were dented. We visited four cities on the trip, and it is fair to say that none of them are likely to become tourist centres in the near future, although there are areas of the coastline that could be developed as such. 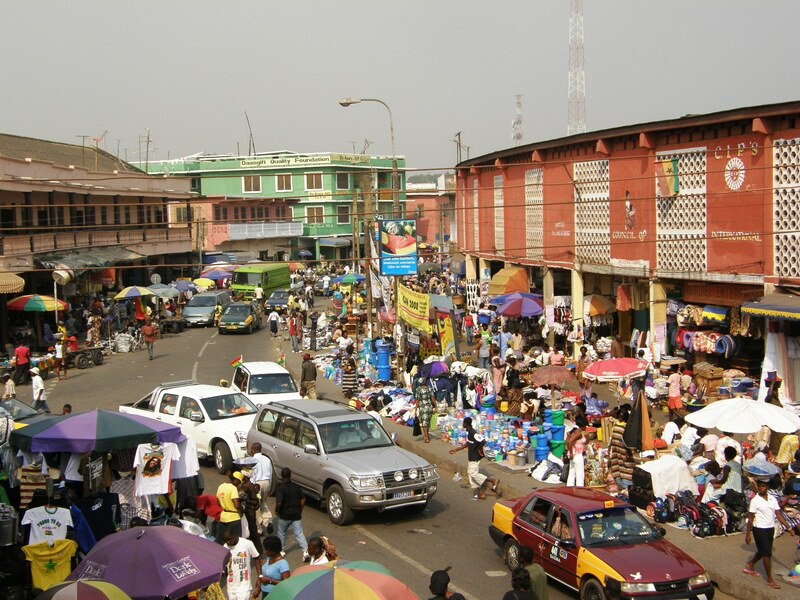 Accra is the capital, and although it has the busy, bustling activities of any major city, it also has many quiet districts in between. 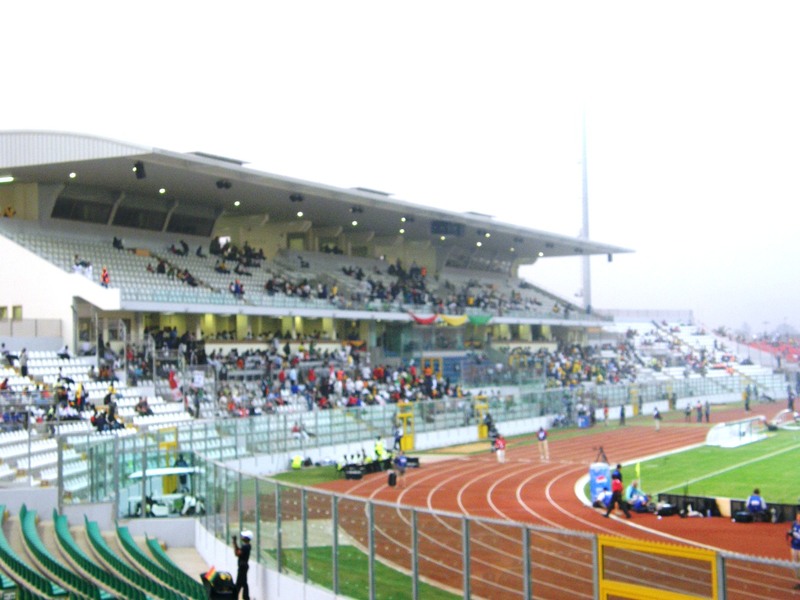 The stadium is based centrally, next to independence square and only a few hundred yards from the coast. It lacks a true centre, or any buildings or monuments of distinction. The oldest buildings are forts that go back to colonial days, when the country was the Gold Coast, although trade was more in slaves than gold. It is the people, the markets and the colours that make the city though  especially the joyous explosion of noise that fills the popular areas after the home team has won a match. All the other cities seemed quite small by comparison. Kumasi was our second port of call, and the one city other than the capital that we went to twice. The features here are some idiosyncratic statues, such as a man standing on the back of a lion  which sits just outside a colonial era church, which appears freshly painted in brown and white. Tamale is the most northerly of our ports of call, featured the Gulpke Na Palace  which turned out to be a series of connected huts, where any serious looking around might have felt like intrusion on those families who now live there. In Tamale, we also noticed another change in that while the other communities had Christian churches, the biggest building here was a mosque. Tamale was the dusty city  one did not have to go far to reach roads that were just red dirt, and the dust from these seemed to pervade everywhere. Finally we went to Takoradi, which is the bigger of a pair of cities, (the football actually took place in its little brother, Sekondi, 12 km away). Here the centre was a large roundabout/market, although having a hotel that fronted onto this turned out not to be a problem, as it was closed down before the football started, and was slow to start up in the morning. During the day, it was a mass of confusing colours, noises and smells. From my hotel window, one floor up, I could see beyond some of the colonial frontages into the interior of the 100 yard diameter circle  and it appeared the whole area was full of shacks with tin roofs. Between the cities, the towns we passed through were of a similar type. For the most part, small single storey buildings with walls of wood, brick, or often dried mud, (or dried mud used as a plaster to cover other materials? ), with tin or wooden roofing. Commercial properties always congregate towards the main road in an attempt to catch the eye of passing trade. It seemed a feature that many towns seemed to concentrate on a single main commodity, so as we passed one, we would see many stalls selling honey, whereas the next may only sell fruits. The land, even close to the villages appeared mainly uncultivated, either for crops or for the grazing of animals. One clear difference between life here, and those countries in Asia which are far more familiar to me is that where clearly many people live poorly, and subsistence farming and trading, there is far less ostentatious wealth here. While this could mean that here in Africa, the difference between rich and poor is lower  there may be other reasons. Do the wealthy of this part of Africa not display their wealth here, but instead move it north to Europe or America? The other question one must ask, in Asia  any country with a large but cheap work force is exploited as a source of cheap labour by capitalist countries, (I wont say Western, as the Japanese, Koreans and even the Chinese now run much of this). While some may question the morals behind these modern business methods, it does bring money into the countries concerned, fuelling the massive growth rates of the Asian tigers. As we travelled through Ghana, though  there was no sign of similar investment. Ghana is one of the most stable countries in the region, so where is the foreign investment? To the purist, this may present an idealised state, as not only do the industrialists fear to tread, but also there is no McDonalds or KFC, (you can never escape Guinness or Coca-Cola though). Is it a fear of accusations of new forms of colonialism that keeps the international companies at bay? Does the instability of some African governments prevent investment in their neighbours? Or is it the fact that West African countries, including Ghana were at the centre of the slave trade that makes any type of exploitation an anathema in the current world? 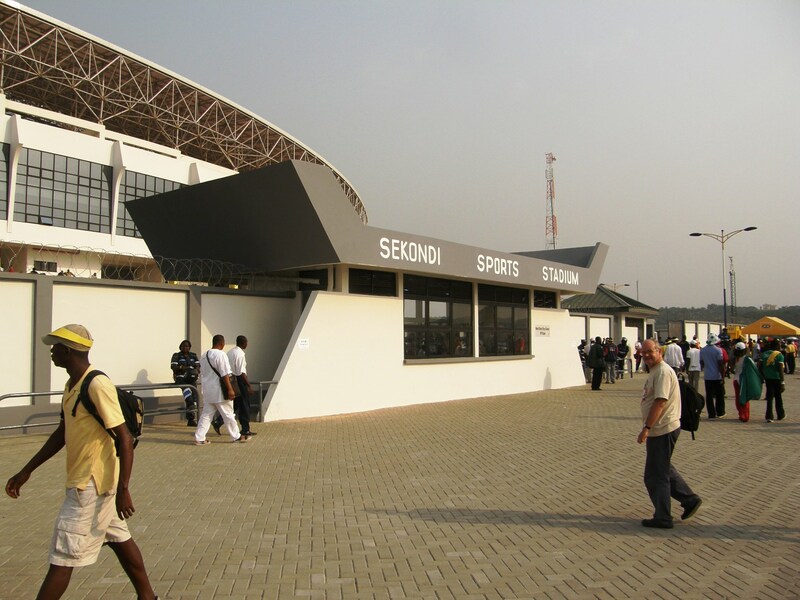 We visited one stadium in each city, those in Kumasi and Accra having been upgraded for the tournament, while Sekondi and Tamale had brand new constructions. In a unique arrangement with the Shanghai Construction Company, the two new stadiums were practically identical, in what has been called the first buy one, get one free deal in stadium construction. 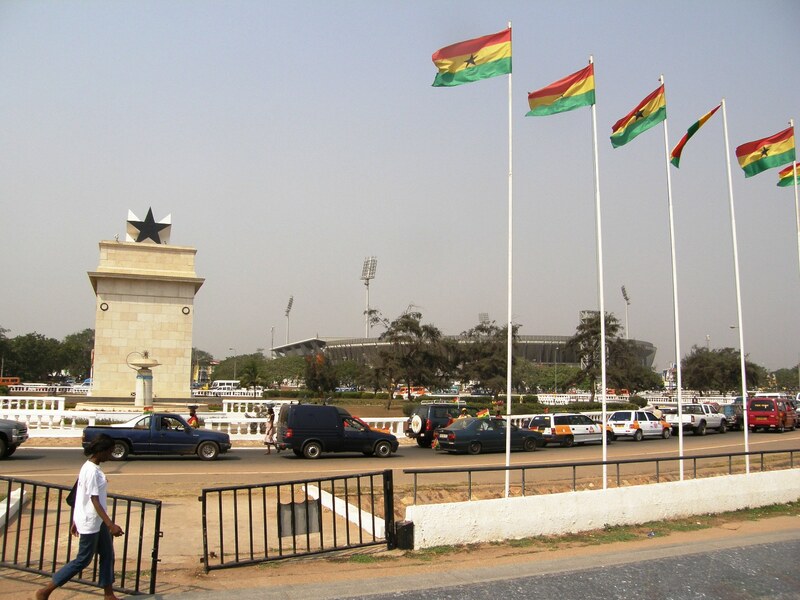 The National Stadium in Accra is known as the Ohene Djan stadium, after the first president of the Ghanaian Football Association, and first sports minister of the independent state. Over more than three-quarters of the circumference of the stadium, it is a two tier, basically concrete construction. The upper tier slightly overlaps the back of the lower tier, and this area is popular with the crowds, especially those whose seats are near the front of the stadium. Despite the lack of a running track, there is quite a distance from the front row of seats to the pitch, as with a ten foot clear plastic screen to contend with, viewing is poor near the front. Along the length of the fourth side is a two tier covered stand, which stands independently from the rest of the construction. This has a concrete cantilevered roof. Most of the VIP and press areas are in the lower level of this stand, and oddly, here too there is enough fencing and barriers to make many of the views disappointing. The uncluttered upper tier is better. The stadium of used by local clubs, including Hearts of Oak, which along with Asante Kotoko make up the big two of Ghanaian football. 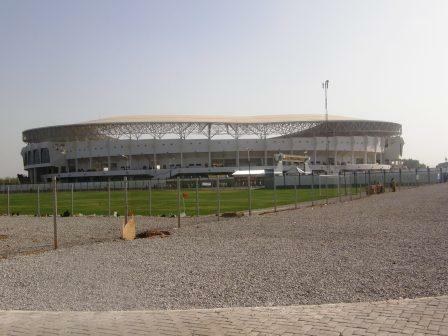 Asante Kotoko play their home games at the Baba Yaya stadium in Kumasi. This is actually a little bigger than the national stadium and is also used by the national team. Again, the main curve of seats surrounds most of the ground, with the main stand an almost separate entity. As at Accra, the seating comes right down to pitch level, and this time there is a running track as well, so those low level seats are again poor. The other two stadiums, as I said are brand new and identical. A single tier of seats, but this time with the lowest seats raised about 10 feet higher than the pitch and its surrounding running track. The barrier that prevents people falling over the parapet though is positioned such that it interferes with the views for the lower three rows, and there are similar problems where the barriers are to keep the sections apart. Unlike the two older venues, the roof does cover the entirety of the seating areas, It is of the type made popular in Germany for the World Cup with a canvas like membrane stretched over a maze of scaffolding. It curves upwards towards the middle of stand on both sides, although this is just for effect, as the seats are no higher here than elsewhere. Anyway, the roofing if projected high above the seats, and yet comes forward no further than the seating, so protection against rain would be limited unless there was no wind at all, and everyone on the East side has the sun in their face at the 5p.m. starts for the games. In all the grounds, there is a cacophony of noise. You do not get the chanting and singing of a European match, but instead a continuous beating of drums and blowing of horns. While this beat seems unchanging throughout each game, and regardless of the score, there is always a further collective cheer whenever the favoured team starts an attack, and a massive roar whenever Ghana score. By the semi-finals, Ghana and Ivory Coast were clear favourites. 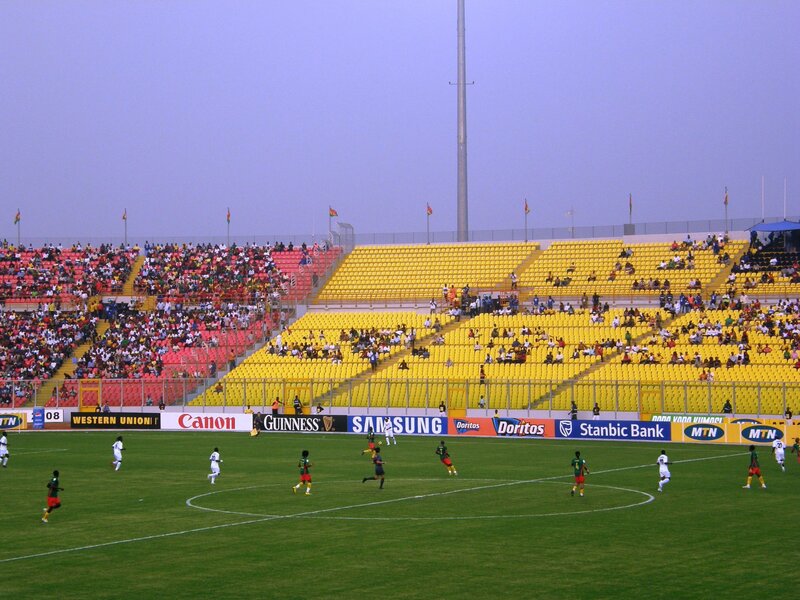 Certainly Ghana should have had big advantages against Cameroon  the visitors had played their qualifier 28 hours later than their hosts, played extra time and then had to travel to Accra on the following day. 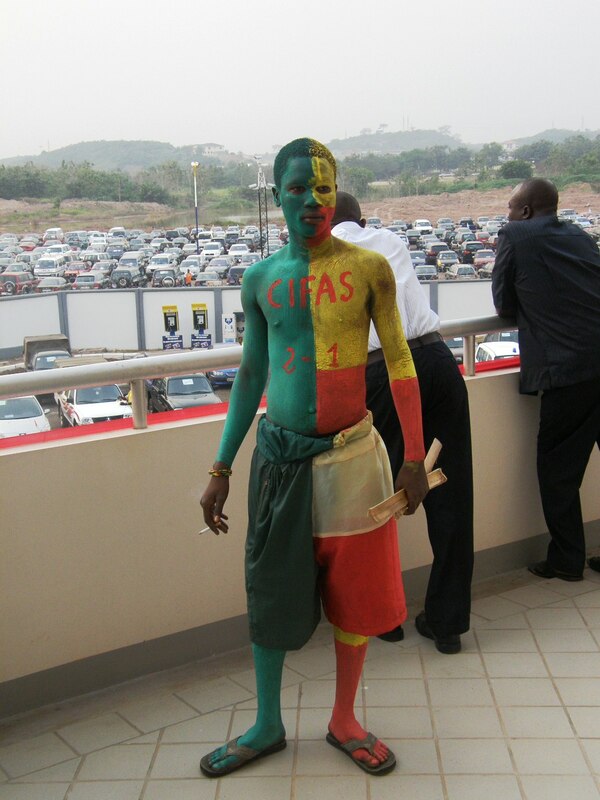 Cameroon overcame all this, and the crowd to win when Alain Nkong scored the only goal. Nkong, coming on as substitute for Joseph Desire Job, currently plays in Mexico, but has also played in Spain, Portugal and the USA. The least explaining incident of the entire tournament was in injury time, when Readings Andre Bikey decided to push over an ambulance man attending one of his Cameroon team mates, when the time wasted was, of course, in his teams favour. The red card earned meant he missed the final. 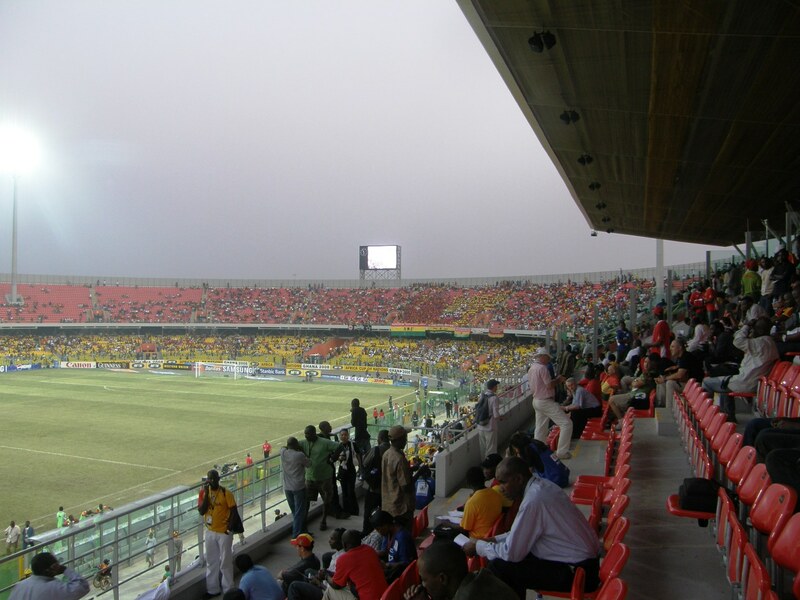 In Kumasi, Egypt had a slight home advantage, as the match against the Ivory Coast was the fifth successive one they played there  the Ivorians playing their earlier games in Sekondi and Accra. Egypt, who had beaten their rivals twice in the last tournament (3-1 in a group match, and on penalties after the final finished scoreless) maintained their record with a 4-1 win. Ghana won the third place play-off, also putting four past the Ivory Coast (4-2). The final, naturally was a closer affair, with a near full stadium despite Ghanas fall. Egypt won when Mohamed Zidan dispossessed Rigobert Song and teed up the chance for Abo Trika. This was Egypts sixth title, the competition record. Etoo, with five goals (all in the group games) was top scorer, but Manucho scored four as did three Egyptians, Abo Trika, Hosny and Amr Zakr. The next tournament is in Angola in 2010, provisionally Equatorial Guinea and Gabon have been chosen to co-host in 2012 and Libya in 2014. The CAF are insisting that even beyond 2014, the competition will still be played in January  a time when the climate across the continent allows play in any area. Sepp Blatters statements are that a January tournament will not be permitted ahead of a June/July World cup in the same year. The probably compromise is that the next tournament after 2014 will be 2017, and then the two year cycle will be in odd years. (This is part 1 of a two part Ghana summary – an extension of the report printed in the Cheltenham Town programme of 9th February. The second part, which will appear on 16th February will also be extended onto this site. Any programme editor that wishes to take items from this site is free to do so, so long as I am creditied and sent a copy of the programme – feel free to edit as you wish, or ask me for the shortened copy as used by Cheltenham). Why does one travel? In my case it may be an attempt to broaden the mind, and hopefully not to broaden the stomach anymore? As you know, I always use the football as an excuse to define my travels across the world, but it is only an excuse – if there was no football, then I would just find some other basis for my travels. Before this years African Cup of Nations, I had picked on four sides, Ghana, the Ivory Coast, Cameroon and Senegal to top the groups and reach the semi-finals. As someone who does not see much about Africa between tournaments, I rely on the form at previous tournaments, plus the old adage  which says that the Arabic Africans of the North, and the Black Africans from south of the Sahara do not tend to fare well in each others lands. And so, despite the fact that both the last two winners, Tunisia (2004) and Egypt (2006) were from the North, I downplayed what was, after all home successes, and instead selected the home side, and some of its regional neighbours. By the time I had seen all the teams play once, including Egypts demolition of Cameroon in their first game, I made only one change to the last four prediction, replacing the extremely disappointing Senegal with Egypt. A week after leaving the country, my revised semi-final list was proved right. With the deadline for this article being before the semi-finals, I am expecting Ghana to play the Ivory Coast in the final, but whoever it is, it should be a good match. (Live on BBC2 tomorrow afternoon). And so to Ghana, and the African Cup of Nations. This is my first footballing trip to sub-Saharan Africa, as the last two tournaments were held in Tunisia and Egypt. I travelled out and back with Ghana International Airways – a single plane operation (and that single plane has Icelandair insignia on the tail and winglets, and a warning that smoking in the lavatories is against Icelandic law), operating a daily flight between Accra and London Gatwick. It is a little different to other airlines (other than they have run out of earphones, and play the movie soundtrack in the PA), and saves £100 over BA, or changing in Amsterdam. The flight actually arrived in Accra while the opening match was in progress. 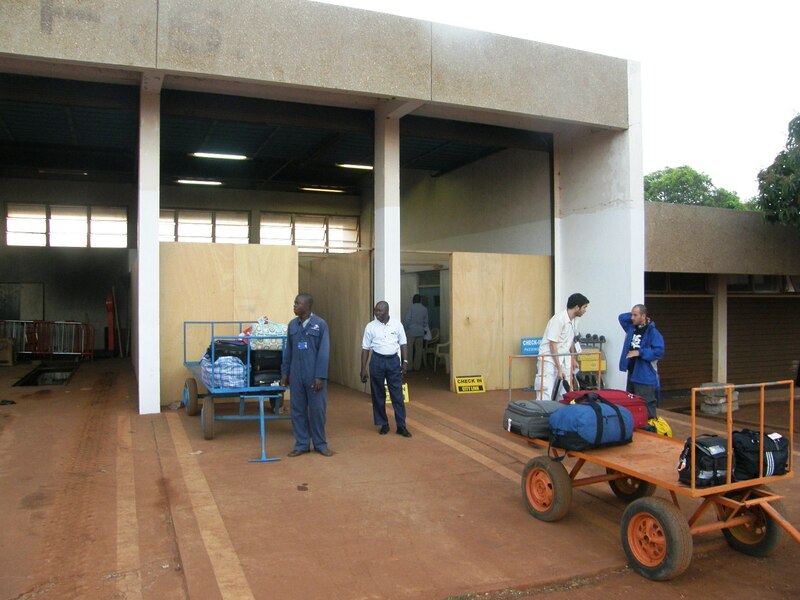 The inside of the airport buildings were quiet, except for a cheer that went up when the hosts scored the tournaments first goal. Outside, there was no shortage of hassle though, two locals immediately took it upon themselves to guide as we moved from the international terminal to the domestic terminal (to enquire, not successfully about an internal flight) and back, looking for the car that the hotel had sent to pick us up. In the end, they asked for a tip of about £10, having failed to do the only thing we had actually asked (call the hotel to check the car was there). I was glad to find out that this was a one-off, and we were not generally asked for a tip every time we requested directions. In fact, most of the locals were extremely friendly and helpful, and one of the advantages of visiting a country where the culture of tourism is not so developed is that you are not seen as a walking cashpoint machine by the locals. I did here a lot of stories of the visiting fans being targeted by criminals, although the crime was always of a sneak nature, and I did not hear of one threatening incident. Certainly you had to be careful of your wallets and passports, (passports in particular being a favourite steal), and I made sure to always leave mine back at the hotel. Sadly, I did become a victim at one stage. I cannot be certain, but this was almost certainly more down to carelessness on my part  as it was my computer that went missing. It seems most likely I put it down in the stadiums media centre and only thought I had placed it in my suitcase, as to remove the machine from the suitcase (nothing else was stolen) would have been difficult. Unfortunately, this problem was compounded by the failure of the locals organisation to communicate across its various branches, so while I was trying to get someone to head directly back to see if my computer was still in Kumasi, (I had travelled the 8 hours to Tamale before spotting its absence), it actually took 24 hours to get this message through. Despite this setback, I never felt unsafe on the streets of Ghana. I never got the impression that there is much violent crime there. A couple of times when I said I was from England, there was a comment about our colonial masters, but it was always said without malice. I have rarely found, even in former British colonies, and resentment against the Brits, and it seems this is true even in what was once the heart of the slave trade. There was an ancient kingdom of Ghana, which reached the height of its powers in the tenth century and practically disappearing 300 years later. Modern Ghana, though has no common territory with the ancient Kingdom, and was a name chosen more as symbolic when under Nkrumah, it became the first African colony to gain independence from European rule in 1957. The name of the area under European rule was the Gold coast, and the original colonists were Portuguese traders, who build a series of forts along the coast, and then traded for gold from inland, without ever taking control of the land. Over the years, there were many clashes between the Portuguese, the Dutch and even the Danes  the British arrived a lot later  at the end of the 17th century, and they were the first to exploit the area for slaves. (This was not because the Dutch or the Portuguese were innocent in terms of the slave trade, but they preferred to trade their slaves from Angola or Nigeria, concentrating in this area in trading gold). When the British arrived, they could not wrest the gold trade from Dutch control, so instead traded for slaves. 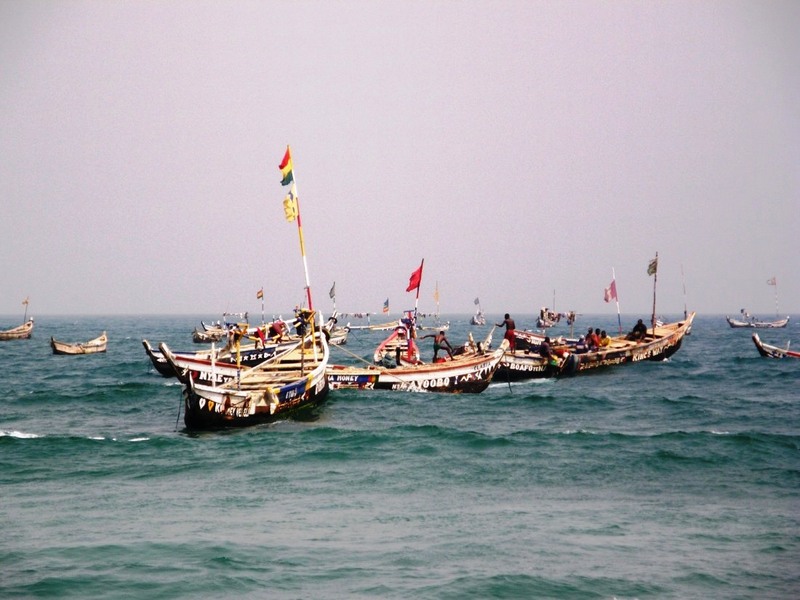 For the next century, slaves were the main commodity of this area of Africa, and around one million people were transported through the ports of Ghana in this period. The European presence was still confined to the coastline for years to come, while the interior of the state was the preserve of African kingdoms, mainly the Fante and Ashanti who fought for power, with the support (as and when was convenient) of either the Brits or the Dutch. The Gold coast was made a British crown colony in 1874, although it then only extended inland for about 50 km. The rest of Ghana became British possessions over the following 20 odd years, mainly to prevent them from becoming the territory of other European powers. So when Ghana became an independent state, it was a combination of many different tribal lands bought together for the convenience of British rule, and not for that of its successors. This has been the way of the world not only for Africa, but for much of the world that was once colonised by the Europeans. Keeping a stable government in such conditions is not easy. Either the various groupings have to reach an (often uneasy) truce, or one group will take power by force. History has proved that with politicians only too willing to mark a slight by one group against another (in Ghana, even the names of the stadiums is a cause for debate), there are not so many things that act to bind a country together. As with just about every other former colony in Africa, home rule for Ghana has not been an easy ride, with various coups, counter coups and dictators. Jerry Rawlings was dictator from 1982 to 1991, and then elected president for a decade; but then stepped down in line with the constitution he had proposed, which limited the presidents term in off  and allowing a peaceful change of leadership. John Kuffours tenure will end soon, and hopefully another peaceful change. In lands with so many disparate forces pulling in different directions, anything that brings the people together has to be a good thing, and sport is one such thing. Everywhere we went, football was the first subject of conversation. This was not just because we were tourists and obviously there for the sport  the matches filled the front, back and centre pages of all the newspapers. European, and especially English football is popular, (although I am think live English football may be limited to satellite TV). At least two of the local football clubs (Hearts of Oak and Asante Kotoko) have their own daily papers, as well as web sites to spread their message. As is the standard for this type of competition, we started with four groups of four teams, each allocated to one city. 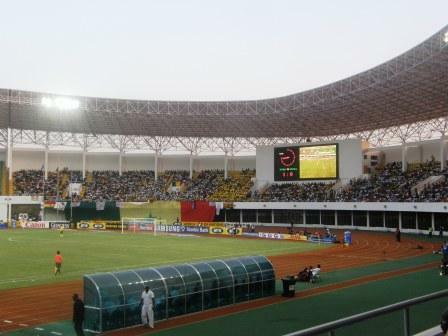 Accra had the hosts, who beat Guinea in the opening match, along with Morocco who overpowered Namibia the following day. Soufienne Alloudi, who plays for Al-Ain in UAE scored a hat-trick within 28 minutes, but as Namibia started to suffer in the second half, they committed a series of fouls earning five yellow cards  Alloudi was the first to be substituted with an injury, and did not play again in the tournament. When I got back to Accra, the matches were a double header, with the first of the two games being the most interesting and vital. The star of this show, Guinea v Morocco was Pascal Feindouno of St. Etienne. Feindouno is also the captain of Guinea, and gave his side an early lead which stood through to half time. There was then a ten minute flurry of events early in the second half  firstly Feindouno got fouled, allowing Ismael Bangoura to increase the lead from the penalty spot. This did not last long, as Hicham Aboucherouane hit back almost immediately. It was Feindouno himself that restored the two goal cushion two minutes later, and it was a cushion that Guinea needed, as Feindouno then contrived to get himself sent off. With the man advantage, Morocco pushed, but only got on the scoresheet once more, in the final minute. The loss of Feindouno was felt by Guinea beyond this game, as he was suspended for two games, a lame draw with Namibia, and a tame defeat when the knock out games started. The match was followed by a nervy match for the hosts against Namibia, in which a single goal from Junior Agogo provided them with all points. 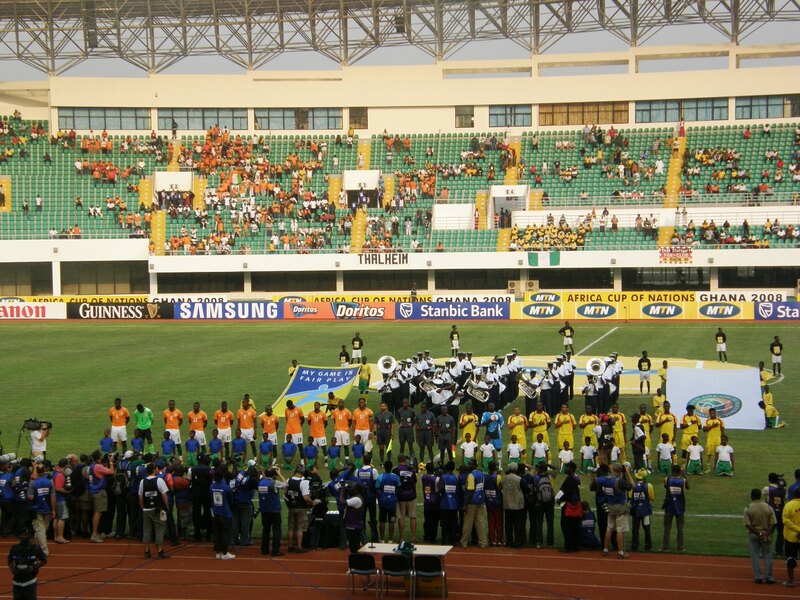 My third visit gave me one more match  as Guinea and Namibia had decamped to Sekondi to play a simultaneous kick off. I saw Ghana needing just one point to be group winners finally live up to their potential in beating Morocco by 2-0. The power of the host side comes from the midfield, and the two goals in this match were by Essien, set up by Muntari, and then Muntari, set up by Essien. The forward line of Asamoah Gyan and Agogo looks to be the weak link, but Agogo has the knack of getting crucial goals. My second series of matches was in Kumasi, a stadium which I visited twice picking up four games in all. None of these was better than the group opener, which saw the holders, Egypt playing Cameroon. 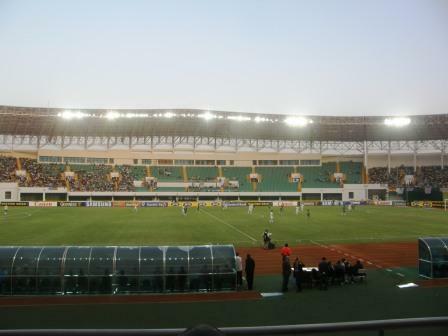 It is generally thought that the holders would struggle in this game  the opposite was the case, as they took the game to Cameroon, scoring two quick goals, and despite two second half strikes by Samuel Etoo, who is now the leading goal scorer in Africa Cups, Egypt ended up victors by 4-2. the second match was a straight forward affair, in which Zambia comfortably dealt with Sudan, winning 3-0 and raised the possibility that they would cause problems for Cameroon in the next game. This too was not to be, I returned to Kumasi to find that Cameroon had recovered their composure, while the Zambian defence was in a charitable mood, gifting the Cameroonians three goals of the five they scored. Sudan then reprised their role as easy to beat, losing 3-0 to Egypt. They also lost 3-0 in the final game to Cameroon, while Egypt, taking things a little easier, picked up the point to win the group with a draw against Zambia. Group D in Tamale was the last to get going. The opening games in this group being my only visit  which is a pity as the drama here was in the second round of fixtures. I saw an entertaining game in which Tunisia took the lead against Senegal, but then got into trouble with an equaliser on the stroke of half time, seriously against the run of play, and a second goal putting Senegal ahead. Tunisia levelled the match with 8 minutes to go. South Africa against Angola was also a draw, 1-1  but it was a point the South Africans did not deserve. The Angolan goal was down to some great play by Flavio, an Angolan striker who plays for Al-Ahli in Egypt, who brought the ball down and then made the short cross for the head of Mateus Alberto, aka Manuchno  the Manchester United bound striker who came across as one of the stars of the tournament. I saw the second round game on TV from Accra, in a small bar run by a coach on the staff of the Heart of Lions club. (Although Heart of Lions is from Kpando, about a three hour dive away, they train in Accra). Senegal scored first, but they were then eclipsed by the Angolans, with two goals from Manuchno, one from Flavio as they won by 3-1. Tunisia beat South Africa, by the same scoreline, which meant that when Tunisia played Angola, a draw would see both through  the teams did not look to collude from the start, but by midway through the second half, you could see no desire to disturb the status quo and the match finished 0-0. As South Africa and Senegal also drew, even this did not really matter. That leaves Group B in Sekondi, where I missed the opening games, played on the day that Morocco beat Namibia  these were two hard fought 1-0 wins, with Nigeria losing to the Ivory Coast, while Mali beat Benin. In the second series, the Ivory Coast were just to powerful for Benin, winning by 4-1 while Nigeria against Mali which was the only truly dull game I saw on the tour ended scoreless. This left Ivory Coast needing only a point from the final game to be group winners, and Mali needing a point to end up as runners-up, but even the prospect of two French speakers ganging up on the Anglophonic Nigerians did not create collusion  The Ivorians beat Mali by 3-0, allowing Nigeria to sneak through with a 2-0 win over Bali. Still Rolling Along! The Ghana Summary. From Kumasi, it is about seven hours by road to Tamale (and that is if you are lucky). One of our first ports of call was the bus station, where we were informed that the next days bus was already fully booked. The obvious course was to find a hotel and chance our luck on a tro-tro early in the morning – but we decided it may be better to chance our luck without the hotel, and start overnight. So immediately after the Zambia-Sudan game, pausing only to get my computer connected to the internet and send in my last report, I met with the others and we found taxis, asking for the tro-tro station for buses to Tamale. We thought we were heading to a newly renovated station mentioned in the guide book, but instead we were ferried to rough car back not far from the stadium. Here a rickety minibus was pointed out, and tickets were bought for the long trip ahead. It was soon after 10 p.m. and we there were only three people on board before our quintet turned up. Three of us elected to take extra seats (in my case with the demand I got to ride shotgun next to the driver), so half of the 22 seats had been sold. We waited and occasionally others would turn up  just after midnight, the numbers had increased to 19  but still the bus would wait. Only when all 22 seats have been sold would it move. Under pressure, the last two of our party agreed to reduce their liability to DVT and buy second seats and then the five of us shared the cost of the final berth, to allow the bus to get away  without us, I imagine it would have been five or six in the morning before it made a move! The ride to Tamale was not uneventful, although I am glad to say I managed to sleep through most of it. The road itself is generally in a good condition, and from time to time we would pass the wreck of a lorry or car that may have happened six months or six years ago, and just dragged to the side of the road. Then about an hour before the destination, we reached a bus that had gone over on its side. This wreck, sitting in the middle of the road was clearly new, and the vehicle was relatively modern as well. A few people were milling around the wreck, but I think these were unlikely to have been passengers, most of whom must have been transported away in search of medical attention. We then had to find a hotel, the guide book recommending a couple of hostels to the north of the town centre, we arrived and found them full, but one sent us around to another place, which turned out to involve more than a mile of travel over unlit dirt roads, hardly a place where we could easily return after the game, or find a taxi to take us to the airport at six the following morning, fortunately, our taxi driver then made another suggestion, which was more conveniently within walking distance of the stadium and on a major tarmac covered road. The building was uninviting at the entrance, but for the local equivalent of GBP10, I got myself a room with a fan, a bathroom and cold water supply during the evening and morning. There was even a plug to use my computer from, so I made to get it out of my bag, only to discover it was not there. I will never find out exactly what happened to it. My intention had been to deposit it within its own bag, and then put that bag inside my suitcase  but I do not have a clear memory beyond folding it closed and waiting for the light to go out, to make sure it had stopped correctly. I may have then put it down and only thought it was in the case, or I may have placed it in the suitcase, in which case someone managed to remove it during the journey. 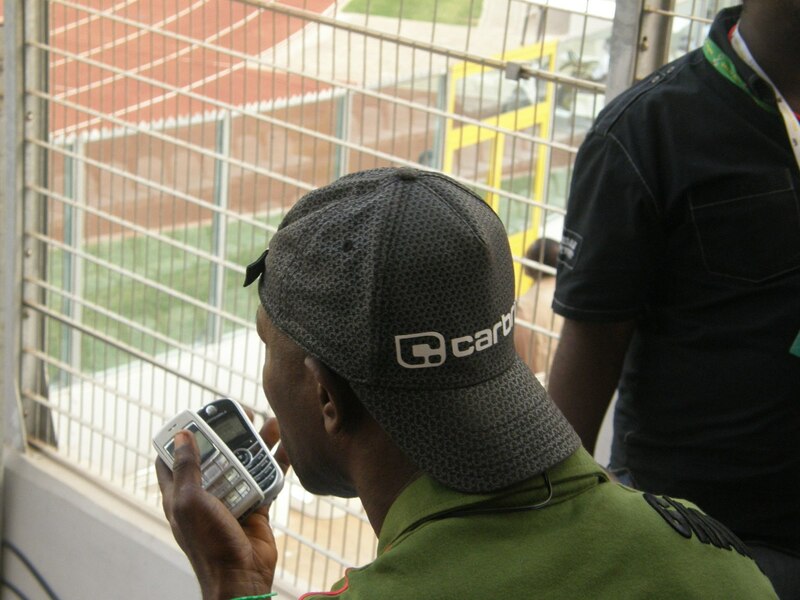 As the earlier possibility was the most likely, I headed direct to the stadium in search of someone to report the loss to, someone who could call the Kumasi stadium and have a quick check made to see if the PC was still there. It took about an hour to find the phone number of someone to help, he said he would call Kumasi to get a check run on whether my computer was still there – but when I returned to the stadium in the evening, I found out (very slowly) that the person contacted was on the road to Tamale, it took until after the two games before I was given an actual name and number of someone in Kumasi, and this meant no check was made to see if my computer had been left until the next morning. Very annoying, as it seriously reduced the slim chance I had of recovering the machine. By contrast with the other places we visited, Tamale can be described as the dusty city. With many dirt roads as soon as you reach the edge of town, the rust red dust from these soon gets on all your clothes, and it appeared impossible to remove it completely from any building. 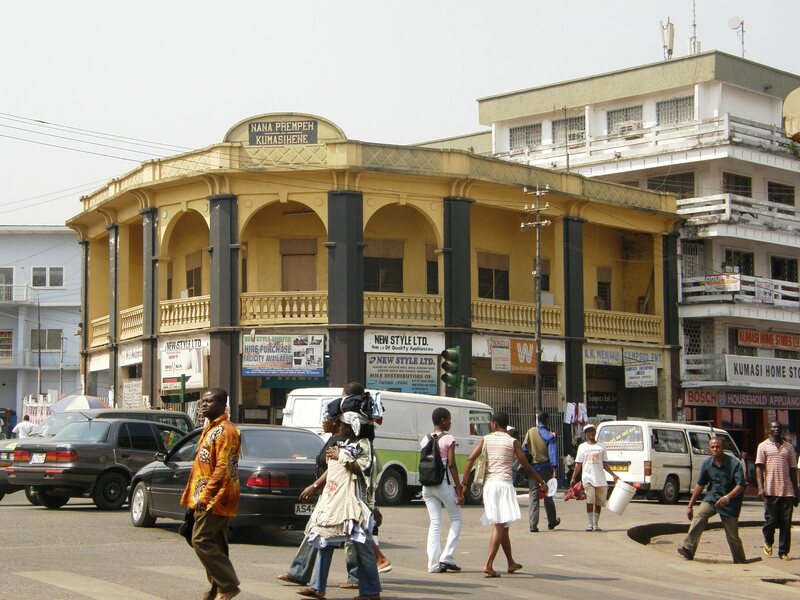 Overall, our visits to Ghanaian cities did not produce much in the way of sightseeing, as there are few old buildings in the country, and the most of the oldest are those from British colonial rule. The Gulpke Na palace in Tamale was an exception though – a series of small thatched huts joined together by walls. The fact that this was still being used as living accommodation by local families meant anything more than a cursory tour outside and a couple of photos may have been taken as too much intrusion. It shows the contrast between Ghana and countries where tourism is considered a major source of income, as if there was a regular stream of foreigners, this would have been a good place to fleece them of their money. To describe the new stadiums of Tamale and Sekondi (which we visited later) separately would be a waste of words, in a unique, buy-one, get-one-free offer from Shanghai Construction, the two stadiums have been build to exactly the same specification. They have a track around the playing field, but the stands are built up so as the lowest seat is about 10 foot higher than the playing surface. This elevation provides much better viewing than those with stands dropping to ground level. A single tier of seats curves all around the stadium, and the whole thing is covered at some height by a roof. The roof is made of the canvas material favoured by the Germans for the last world cup, and is supported by a complex scaffolding of metal tubes. It is one of those that rises above the centre portion of the seating area, but the reason for this is not clear, as the seating does not go any higher of deeper in this area. The roofing did not appear to extend further forward than the front row of seats around the stadium, and with it being raised well above the seating, one imagines that if it was wet and windy, all the spectators on one side might get wet. Meanwhile, starting the match in the heat of late afternoon, the roof provides no shade at all to the Eastern side of the ground. 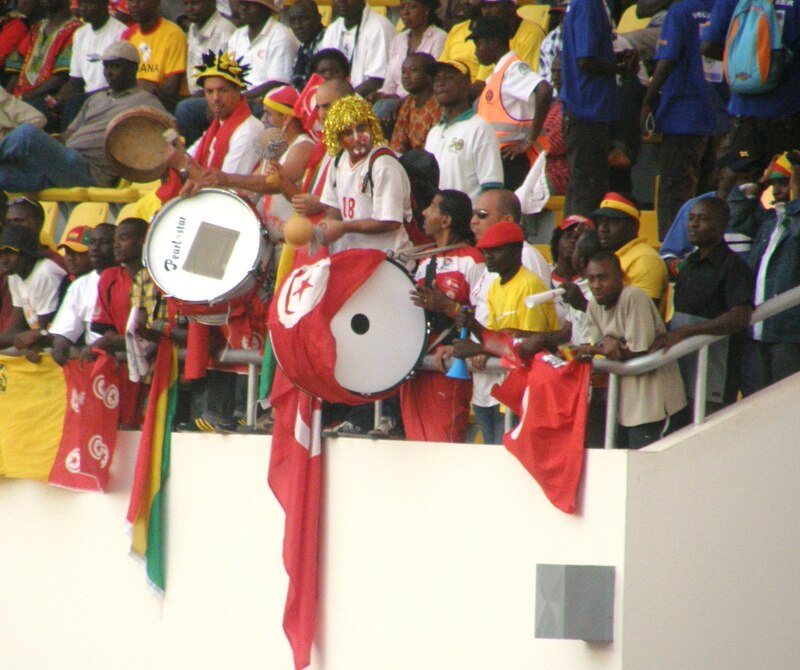 So starting in the heat of said afternoon, our first game in Tamale saw Tunisia take on Senegal. Tunisia used four players from the local league in their team which included players from the German, Swiss, Russian, French and English Leagues in a 4-3-3 formation, while Senegal were split with five players from each of the Premiership and the French League, with a single representative from the Portuguese League. Issam Jemaa gave Tunisia the lead in the 9th minute, and it the 2002 winners looked the best for most of the first half, but they were surprised when Senegal levelled on the stroke of half time. The second half started with Senegal on top, and Tunisia looking out of the game. Desperation appeared to set in early as the Japanese referee booked Dos Santos for a dive which certainly would not have graced the Olympics. The normally dependable Niang should have put Senegal ahead just before the hour mark, when receiving a cross from Mendy on the left wing. This was the last action before Mendy was replaced by Henri Camara – a good move for the team as he added pace and guile to the forward line, helping cause confusion in the penalty area from which Diomansy Kamara put Senegal ahead. As the game went on though, the pendulum was swinging back to Tunisia – still it took a great long shot from Medji Traoui to level the scores. This was the last goal of a really entertaining game, far better as it turned out than the one that followed between Angola and South Africa. South Africa have failed to impress in recent African Cups, and this was to be no exception – for most of the game they were overshadowed in every department by the Angolan side. Playing up front for Angola was the partnership of Flavio Amado, who plays in Egypt for Al Ahli, and Mateus Alberto of Petro de Luanda in Angola. Flavio looks like a really skilful player, and the way he controlled the ball and set up the goal for Alberto. Alberto on the other hand looked like a real predator. It is common with players in Portuguese speaking countries such as Angola that they can take a name other than their actual name. Mateus Alberto is better known as Manucho and has been signed by Manchester United. South Africa were lucky to come out of the game with a point, when Elrio Van Heerden scored late in the match. 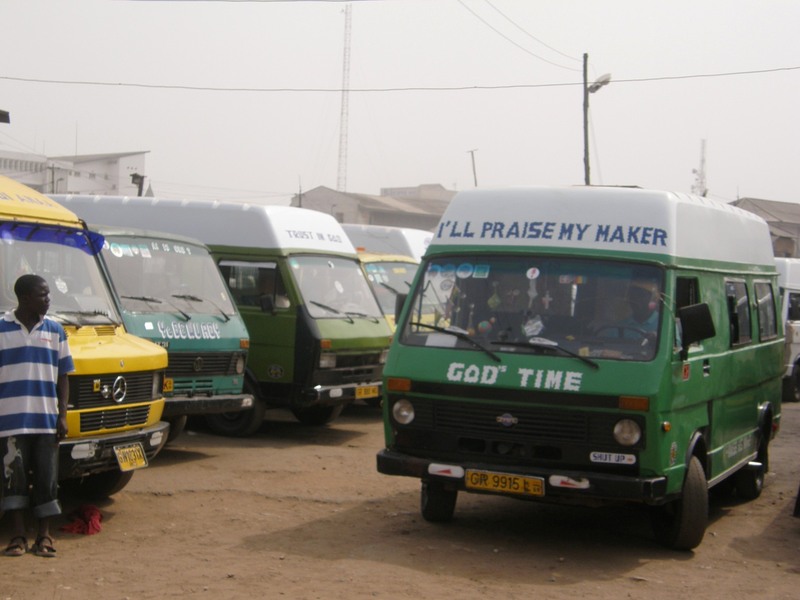 If getting into Tamale involved a long hard ride in a tro-tro from Kumasi, returning from Tamale to Accra involved as much luck as judgement – and no little cash as well. Knowing that our longest trip within Ghana was best done by air, we had researched the flight companies before leaving, and even made a reservation on the local companies web page. Although this allows us to print off a reservation – the system leaves payment until you get to Ghana. We had asked, when arriving at Accra about our reservations, and we were told they were OK, but that no one could take out payment at the time (too busy watching the game on TV). In Tamale, though we got a different story. Not only were our reservations imaginary, but the flight was actually four hours earlier than the time we had been given. Fortunately, when our boys got to the office, only 27 of the 34 seats on the flight had been reserved, so we managed to get our quintet on board, for the minor sum of US$150 each. Of course, this was another day, so it also means another two games. We were back in Accra, and the first of the four groups had to undergo their second games. First up was Guinea against Morocco. Guinea had lost to the hosts in the opening game, while Morocco had thrashed Namibia by 5-1. The star of the show was Pascal Feindouno, as St. Etienne midfielder who has been rumoured to be wanted by Liverpool. His record was to open the scoring in the 11th minute with a splendid curling free kick from the left, and then delivered a perfect through ball for Ismael Bangoura to increase the lead just before the hour. Aboucheroune pulled one back for Morocco almost straight away, but then Guinea won a penalty and Feindouno was again on hand to score. At 3-1, the Guinea skipper must have felt like a break, so he kicked out at a player holding him, and picked up the tournaments first red card. This did not matter much in terms of the match, with Morocco only pulling the score back to 3-2 in the closing minutes, but the lack of the inspiration he provides to side made them look flat in drawing with Namibia in the final group game, and the suspension means he also misses the first knock out game against the Ivory Coast. 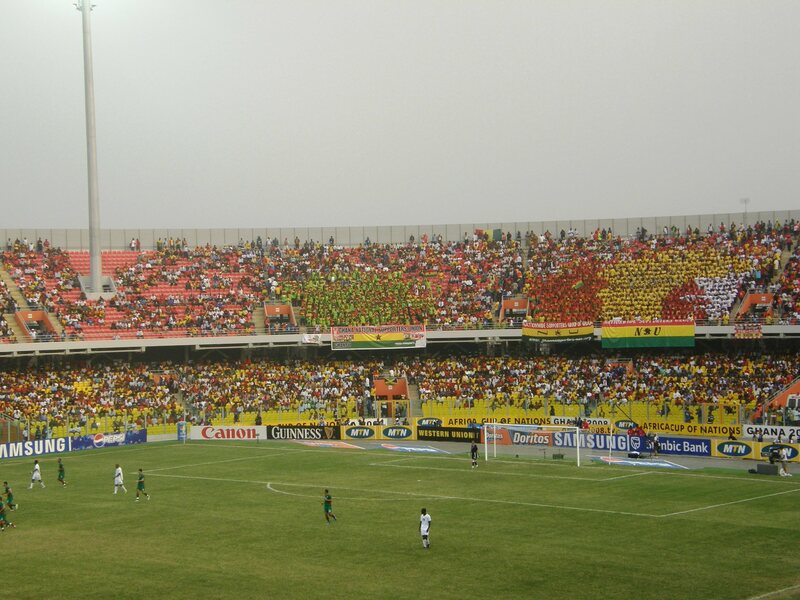 The main game was Ghana against Namibia, with the home fans hopeful of a hat full against a side that did so poorly in their opening game, but it was not to be. The game was nervous and flat, and Namibia were determined to prove that the opener was not their real game. They succeeded in frustrating the home side most of the time, while both in this game and their next group game against Morocco, I felt that while the Ghana midfield, especially Michael Essien and Sully Muntari were excellent, the forward line of Junior Agogo and Udineses Asamoah Gyan were not up to the job. As it was though, Agogo scored just before half time to give his side a 1-0 win. Never people to stand still, the next day we were off to Takoradi. 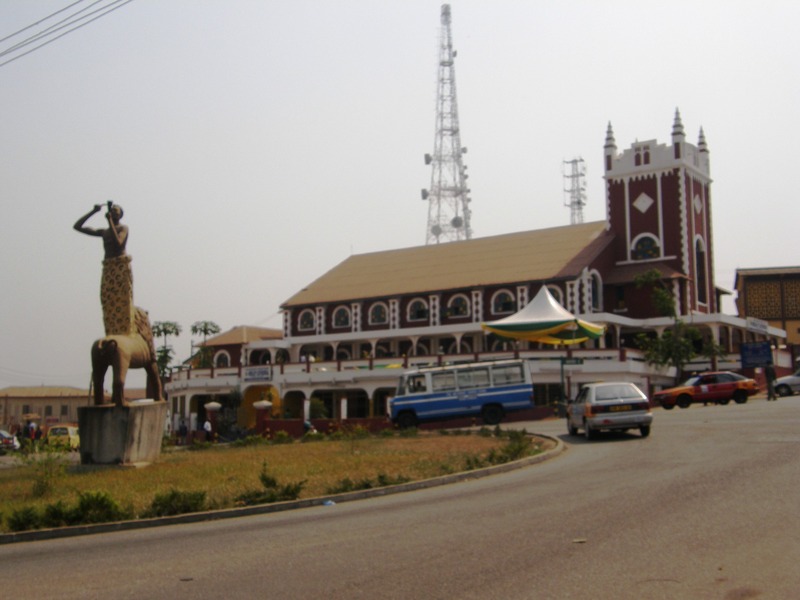 Takoradi is the major part of a two city conurbation, with its partner, Sekondi about 12 km away containing the football stadium. From Accra, the bus service takes you to Takoradi, and it is the easier to get way from, so that is where we went. On arriving, we settled into a small, friendly but rather less than clean hotel in the very centre. This was the most interesting stop of the trip, with a very colourful market immediately outside my window. Always among the favourites, the Ivory Coast had a 1-0 win over Nigeria in their opening match, and were now up against outsiders Benin. Although Benin put up some good resistance in the first half, they were eventually brushed aside. Didier Drogba rushed onto a through ball to score the first just before half time. Yaya Toure quickly added to it, and Abdul Keita and Aruna Dindane added more. The Ivorians relaxed after this, and Benin got a consolation in the final minute. 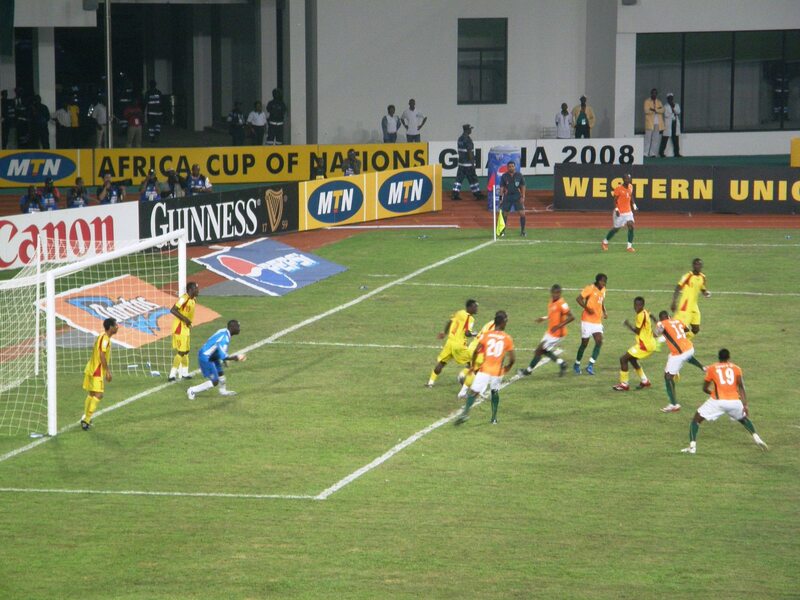 It was followed by the dullest game I saw on tour, and the only game without goals as Nigeria played Mali. Having managed to expand our group of five to nine for the next leg, we managed a private hire of a minibus with driver for the next leg, and travelled in relative comfort. This made up in some way for the fact that over 20km of the road between the second and third biggest cities in the country was just dirt, with no sign of tarmac for miles. We got back to Kumasi, found a small hotel (the cheapest on the trip at under £10, the only one without en-suite bathroom, but at least cleaner than Takoradi or Tamale, and again with friendly and helpful staff). I quite like Kumasi, despite the loss of my computer there, and I was happy to spend some time wandering around and admiring the rather odd statues. Outside the main church, there was a man standing on the back of a lion – the question being, how to dismount? (very carefully?). Cameroon were beaten 4-2 by Egypt in their opening match, so they needed redemption against Zambia. The Zambians, by virtue of their 3-0 win over Sudan were in a position where progression was quite plausible, if they could get something out of this game. As it turned out, the Zambian defence turned out to be the most generous charity in the country as they gifted three goals to Cameroon, and ended up defeated by 5-1. Egypt followed this up with a comfortable 3-0 win over Sudan. I did not return to Tamale, so my last but one day in Ghana was my only football free day of the tour. We used the bus to return to Accra, and I talked for a while with a research worker who was studying the economy of the coffee growers in some small village. He told me a little about the villages, which exist without running water or power, although foreign aid has provided them with diesel pumps, which is a step better than hand pumping water. Only one person in the village has a car, and although they may want to follow the football, they have to do it without the aid of a TV. The arrival back in Accra was not as easy as I might have hoped. Somewhere during the journey, my stomach had turned, and I wanted to get back to the hotel quickly. The taxi driver thought he knew somewhere to buy tickets for the next day’s game, so we made a short stop at a radio station (it turned out to be an unsuccessful stop). Then on returning to the road, we started to speed through along the dual carriageway when another taxi pulled in front of us, and we smashed into its back. Still, like certain Martini’s, we were shaken but not stirred by the incident, and with a change of taxis, we managed to get to our hotel in one piece. At least back in Accra, we had the benefit of a TV in order to watch the second round of Group D games. The feature of this was the eclipse of Senegal by Angolans. Back in 2002, El Hadji Diouf and Papa Bouba Diop had been stars as Senegal had beaten France in the World Cup. Now the same players were ordinary also-runs as Senegal themselves were beaten. Manucho and Flavio were again the stars for Angola. Less surprisingly, the match was followed by Tunisa beating South Africa, by the same scoreline 3-1. You are currently browsing the Football Shaped blog archives for February, 2008.